I've been a huge fan of Julie Ebersole for many years. Her Hello Monday videos for Ellen Hutson are hands down my favorite papercrafting videos. Professional, useful tips, and a dynamite project -- her videos are fabulous. Plus her personality shines through. I'm thrilled to see her working in the industry. Hugely deserved. Every card she makes has a light and airy feel that I would LOVE to be able to emulate. I don't think of Julie as the Queen of Clear and Simple. Rather, Julie is the Queen. The hardest part of ReDesigning a Julie creation was to select one, since I love everything she makes. So I decided to just go with the last thing she made at the time I was looking, which was this Flower Gard card for Hero Arts. Here is Julie's card, with mine, ReDesigned without spending a dime. Thanks, Julie, for letting me post a copy of your card. 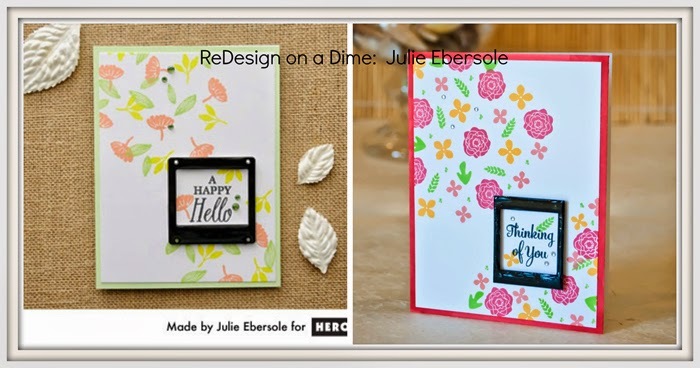 I encourage you to check out Julie's card on the Hero Arts blog (link above), where she's done a great video on how to make it. Watch her cover the frame with glossy accents -- smooth as butter. I cannot do that, so mine is lumpy...and this isn't the first one I made. Wish I had some small solid flowers with stems, because the flowers with stems in different directions provide the illusion that the flowers are falling down the card. But, I didn't, so I went with what I had -- that's the whole idea! I also switched up the color palette 'cause I'm in a bright mood. What a delightful tribute to Julie. She's amazing, and so are you! I really appreciate this series and seeing the amazing results you have achieved with what you already have. Love it! Love your redesign of Julie's card! I agree, Julie is da bomb. You are pretty special yourself, Joan! I love your new ReDesign on a Dime feature; it is a great idea and we get bonus inspiration. Your card is just as delightful as Julie's. Fabulous card, and I love the name of your new series. Your card is just as pretty as Julie's.